What service does Disaster Relief provide? We provide a Disaster Loss Valuation which gives an estimate of the home’s Fair Market Value before the disaster occurred. We also provide an estimate of the loss in value due to the disaster. We also provide supplemental information that you or your tax preparer will find useful in order to file your claim properly. Who qualifies for a loss deduction in the wake of a federally declared disaster? The claimant must be a taxpayer. The taxpayer must have paid taxes in the year immediately preceding the disaster or expect a tax liability in the tax year in which the disaster occurred. The claimant must be a homeowner - specifically the owner of a personal residence that was damaged in the disaster. Personal use residential real property. A property is not considered a personal-use residence if any part of it contains a home office used in a trade or business or transaction entered into for profit or is rented; the definition also excludes mobile homes and trailers and single building units of which the owner does not own the structural components. What do I need to do in order to claim my deduction? You must determine the decrease in the FAIR MARKET VALUE of your home by obtaining a valuation of the property before and after the disaster. While there are other options, this is the most common way to determine the loss. 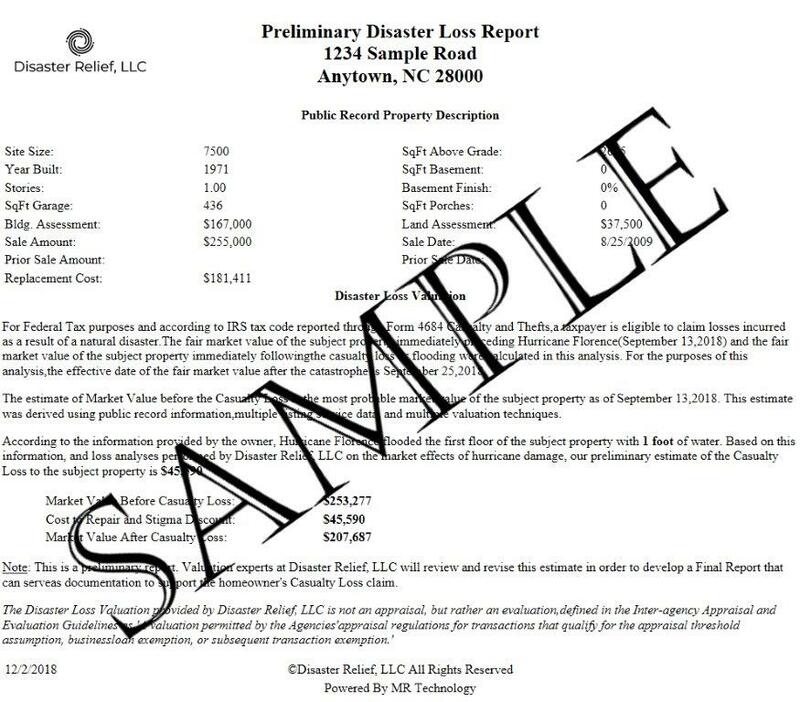 DISASTER RELIEF, LLC provides this loss computation. How is the amount of the loss deduction computed? IRS form 4684 (CLICK HERE FOR LINK) must be completed in order to file your claim. Who files my claim with the IRS? You or your tax preparer may file the claim as a deduction on your prior year’s tax return (requires an amendment to the prior year’s return). or as a deduction on your return for the current tax year.